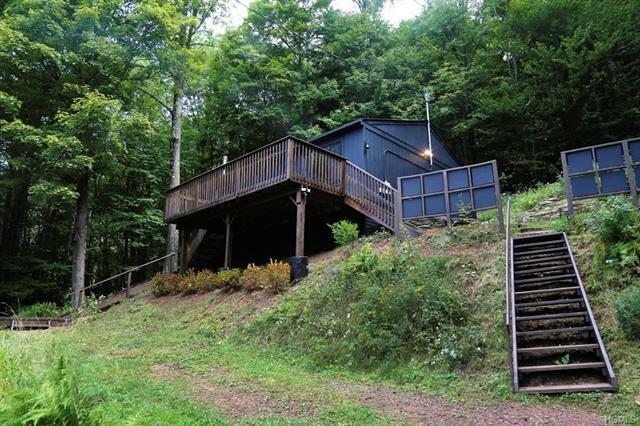 70 Mountain Terrace is a very private and perfectly remodeled midcentury two-bedroom cabin with a bonus guest house and deeded lake rights. The front door lets you in to an expansive living room with two oversized windows that soak in both light and country air. Just through the living room, is a fully remodeled chef’s kitchen that features stainless steel appliances and natural stone countertops. The cabin also features one wholly remodeled bathroom. The bedroom layout of this home is more than ideal. The design allows for both owners and guests to enjoy the home, while preserving privacy and absorbing the stunning natural surrounding of the property. Lastly, a bright and thoroughly renovated guest-house is situated just fifty feet away from the main house. This space has been outfitted with large sliding doors, new hardwood floors and lighting.